In honor of the Year of the Pig and for all those people who think bacon should be it's own food group, we are happy to announce our delicious, heritage breed pork is available on the Hay Mama site while supplies last. It was over 5 years ago when we got our first drove of pigs at the ranch in a desire to learn more about pigs, the process of raising them, and to see how much better the resulting product would be. We sourced 8 heritage breed piglets, a Berkshire Duroc cross, to begin this journey. Not long after they arrived at P Bar, our family spent some time at the ranch, much of it with the pigs. We all immediately fell in love with these amazing and sweet creatures. They were shy at first but soon warmed up to us after our 3x daily visits to hand feed them apples, watermelon, and other produce. They would run up to us and nuzzle on our shoes and legs and enjoyed back scratches as well as all the treats we brought them. 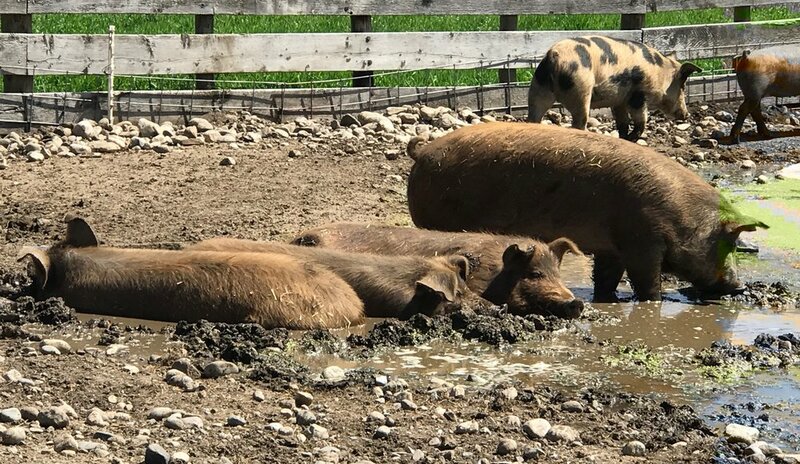 Their setup is all a pig could ask for with a pond fed by a constant flow of fresh water, mud to roll around in, and a small pasture to roam in where they could eat grass, dig up roots and play with sticks. At that time, our daughter was around 10 years old and she adored the pigs. When she soon after realized we were raising them for meat, she protested and said she didn’t think anyone should eat them and declared herself a vegetarian. Luckily she is an open-minded person and a great listener, so we engaged in conversations around livestock, the commercial meat industry, and what it meant for these creatures to have a high quality of life. She gained an appreciation for why someone may choose to be a vegetarian. She also recognized that if you did not want to go the vegetarian route, choosing to eat meat raised in an ethical and responsible way was a virtuous option. Understanding the horrific conditions and treatment of animals at industrial pork operations (which is how the vast majority of the pork produced in the US is raised), and realizing the horrible impact such practices have on these smart and sweet creatures, she concluded we were offering a much better alternative. She went on to create a tri-fold brochure that anyone who enjoyed our early pork products had to read and sign to make sure those people knew these animals were 1) loved 2) well cared for and 3) respected. One of our key tenets in raising cattle and pigs is providing them with the highest quality life and least amount of stress possible. We believe it is our responsibility as stewards to help our land to be as healthy as possible, and that goal also includes all the animals that are part of that ecosystem, whether wild or domesticated. What you’ll experience when it is time for a meal, is the culmination of this endeavor and it is what makes this pork so tender, delicious, and special. We choose heritage breeds, raise them well and without growth hormones or antibiotics, and process them at the same artisanal packing house we use for our beef. Prepare it with care, and know how grateful we all are that you are part of this journey. I’ve been wanting to write for a while about some of the practices that happen with conventionally raised beef in the US. I’ve been reluctant because, frankly, the things that are common practice are really scary. I think we take a lot of it for granted because there is some government oversight so we presume it is safe and healthy. So, I figured Halloween was a good time to cover some of these frightening topics. This only scratches the surface on the issues with feed lot cattle and should strengthen your conviction as a customer of Hay Mama and grass-fed, antibiotic free beef of the importance of 1 )understanding where you food is coming from 2) eating food grown in the way it was meant to be grown and 3) avoiding factory farming products. In future newsletters I’ll tackle some of these topics in more depth, but for now, here are my Top 5 Spookiest Facts About Industrial Cattle. 1. Antibiotics. It is not a secret that the vast majority of cattle raised in the US consume antibiotics in their food supply. Antibiotics promote growth in animals, and a cow given subtherapeutic antibiotics in their food and water grows to full weight in about 16-18 months (versus our cattle which are full weight at 24-30 months). Because of the unsanitary and confined living conditions at feedlots, antibiotics are also used for both disease prevention (when one cow in the herd is sick and they treat them all) and disease treatment for a sickened cow or herd. Lastly, because the cattle are eating large quantities of food that are not the type of food they’ve evolved to properly digest, they are vulnerable to multiple diseases. The widespread subtherapeutic use of antibiotics has led to concern that such practices are contributing to the emergence of resistant strains of bacteria that propose risk to human health. In addition, do we really want to eat meat from cows consuming antibiotics? There are a many scientific articles worth reading and here are a couple you should check out if you want to learn more. One is from the American Academy of Pediatrics on the dangers of this practice and where they have come out against the practices of adding antibiotics to livestock feed and also one from Consumers Union on why this practice needs to be eliminated for the sake of human health. So, be sure the meat you are eating is antibiotic free and especially free from subtherapeutic antibiotics. 2. Corn. Cows are ruminants, meaning they are animals with four-part stomachs. They have evolved a complex system that makes them perfect for consuming and digesting grass and converting that grass into muscle and fat. It’s not natural for cows to eat large quantities of corn, soy beans and other grains in large part because they are ruminants. Animals on a grain-based diet suffer from many health issues including bloating, excess gas (the methane problem that is talked about often in the context of climate change), and liver disease. In addition, cows consuming grain are more susceptible to E.coli infections which can contaminate the meat and Acidosis, a chronic disease caused by a corn diet, is found in 13-32% of the cattle slaughtered. 3. Feed lot conditions. Most cattle are born in pasture and once they are weaned they are trucked to feedlots for fattening. If you have driven I5 through the Central Valley you have undoubtedly seen (and smelled) the vast expanse of cattle in feedlots near Harris "Ranch". Cattle living in feed lots no longer graze but instead stand in cramped quarters in mud and manure in a loud, stressful, and smelly environment. They get very little physical activity which leads to weak muscles and a much paler meat. Their "diet" is delivered to concrete troughs in trucks, and there is not a blade of green grass in sight. 4. Animal treatment. This is perhaps, in my opinion, the scariest part of conventional beef. The handling and treatment of cattle at feed lots and large scale slaughterhouses can be horrific and has been well documented. There is a really well done (although challenging to read because it is pretty disturbing) article from Rolling Stone that follows a group of animal rights activists who infiltrated factory farms to expose the atrocities there. 5. Additives. Again, there is so much we could say on this topic. For me, the part that is most scary is how little is or has to be labeled. From pink slime to the acid that is sprayed on commercial carcasses at slaughter, if it is a low enough percentage of the overall product, it does not have to be disclosed. You can argue about whether these practices are healthy or necessary, but I for one think ALL things added at any level to the beef should be disclosed and any processing that has been done should be listed. Consumers have a right to know what they are buying and putting into their bodies. By purchasing from small producers who provide full transparency, and who tend to avoid additives and chemicals you can have much more confidence about what you are consuming. Hay Mama beef is processed one cow at a time and each package can be traced back to a single cow and nothing is added. Isn't that what we should expect from our food producers? In a recent interview, Michael Pollan talks about the beauty of cattle grazing. The interviewer asked, "[Cows] can take this grass which we can't digest, very few creatures can digest, and turn it into [fuel]. What is so amazing about that?" Pollan's response: "Well, a cow out on grass is just an incredible thing to behold. ... Cows and other ruminants can do things we just can't do. They have the most highly evolved digestive organ on the planet, called the rumen. And the rumen can digest grass. It takes grass, cellulose in grass, and turns it into protein, very nutritious protein. We can't do that. We can't digest grass. So to take land that is not good enough for agriculture -- that's growing grass and nothing else, that's been doing that for 10,000 years since the buffalo -- and put a cow on it ... there's something beautiful about that, and it's just the way it was meant to be." We bring a sense of purpose to all aspects of Hay Mama, from our cattle’s life cycle to land management and biodiversity. This month, we’re looking back at our twenty-year history to acknowledge our sustained values, relationships with the land and the people as well as sharing news on two new certifications. Since 1998, P Bar Ranch has cultivated a deep relationship with the land and surrounding ecosystem (incidentally, it was the same year Kristi and Tom were married). We feel sincerely connected to Sweet Grass County, to the community there, and the rich biodiversity that surrounds it. One of our central missions is to leave the land better than we found it. Hay Mama mirrors those P Bar Ranch values, and natural cattle grazing is just one of the ways we promote sustainable stewardship. Hay Mama began as an outgrowth of the broader P Bar purpose. While Tom was raised working on a farm in Colorado, I grew up an ethically minded kid from Santa Cruz who spent many years in my 20s as a vegetarian and PETA activist. As we spent more time together at P Bar, I came to appreciate that you could raise food in a way that respects and improves the environment, honors the animal, and results in a delicious product. In starting Hay Mama, we wanted to promote the importance of raising cattle with sustainability, ethics, health, and family values in mind. Providing our beef to friends, loved ones, and the larger community allows us to practice and share what matters to us as a family. These mutual benefits transcend beyond the beef we provide to our customers. The cattle at P Bar Ranch play a beneficial role in the greater Yellowstone ecosystem and the native grasslands found there. Cattle grazing is essential to maintaining healthy conditions for the variety of grasses that grow on the ranch, numerous bird species, and a wide variety of other mammals, providing a truly symbiotic relationship. The cattle play the role the millions of bison served when they roamed these hills hundreds of years ago. This summer we received two certifications at the ranch focused on areas that are important to us. The first is with Western Sustainability Exchange, a nonprofit that “pursues environmental stewardship, economic prosperity, and community well-being as interlinked goals.” The WSE Certification ensures that an operation adheres to the following principles: treats animals humanely, does not use hormones and sub-therapeutic antibiotics, significantly reduces or eliminates chemicals used in production practices, and protects open space, wildlife habitat, and water and soil quality. We share these priorities with WSE and are happy to partner with them to help evangelize how critical it is that we all eat grass-fed beef that is raised humanely and limit the practice of raising cattle on feedlots. The second certification we received is through the Audubon Conservation Ranching program which certifies that our cattle graze on land managed with bird friendly practices. Prairie grassland bird species are in severe decline largely due to the conversion of cattle ranches to crops like corn and soy that are then fed to feed lot cattle. Having a healthy and diverse bird population and doing all we can to support our resident, migratory, and breeding species is one of our key tenets. We are excited about what is possible over the next 20 years and appreciate the support and interest of all our partners and customers on this journey. Wondering what to get dad for Father's Day or his birthday this year? We strongly recommend a Traeger wood pellet grill. If you appreciate meat, the quest to find the ultimate grilling experience is never ending. This is particularly true when you seek to reconcile the need for convenience with the essential elements of heat and smoke. My dream grilling experience is a riverside campfire, with a deep bed of smoldering coals and the gentle approach of twilight on a warm Montana summer evening. A close runner up is tending the Traeger in my driveway at home. It’s that good. How can that be, you ask? 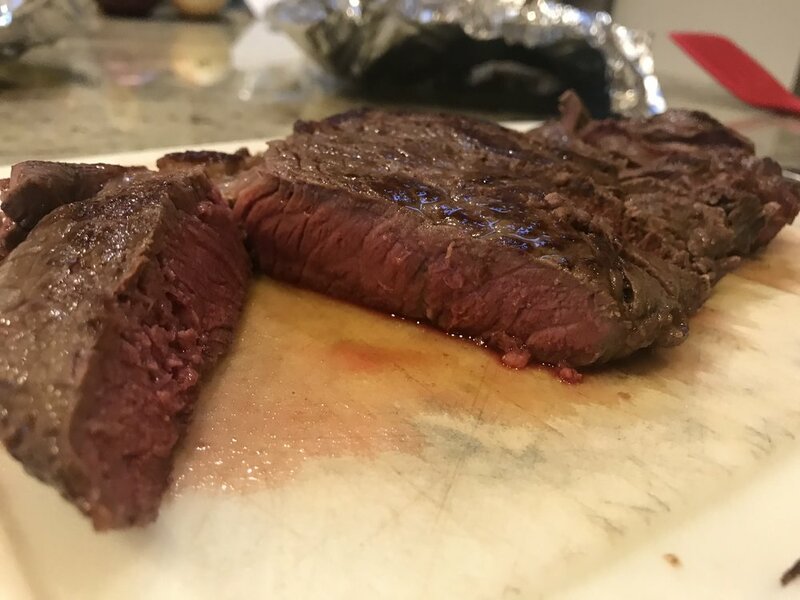 The primary reason is the meat you prepare on the Traeger will have the wonderful smoky complexity of a live fire grill and a delicious moist texture that isn’t achievable on a gas grill. In my opinion, “classic” grilling leads to meat that is too dry and a somewhat acrid flavor from the excessively high heat that sears the meat and the smoke from the fat that drips off the meat. The Traeger generates indirect heat by burning wood pellets that retain the wood smoke (and if you set the temperature low enough, you can use it as a smoker) yet the computer controlled combustion system produces a wide range of temperatures simply by adjusting the dial. It couldn’t be easier. What I particularly love is the way you can use different types of wood pellets to create different flavor profiles depending on the meat you are cooking. My favorites are hickory for pork, mesquite for beef, apple for chicken, and alder for salmon. Recently I have been experimenting with putting the meat on for 20-30 minutes on smoke, taking it off and turning the heat up, and then putting the meat back on to cook it to the temperature you want. This approach also helps ensure the meat isn’t too cold when you put it on the grill, which can lead to the outside cooking too fast relative to the internal temperature. The Traeger allows you to experiment and develop “grilling wisdom” that satisfies some deeper genetic programming from our ancestors on the plains. An important tool to have handy with the Traeger is an instant read digital thermometer. You need this to monitor the meat as it cooks, because your habitual read of the meat based on “it looks done” just won’t cut it with the Traeger. You won’t see the sizzling fat and moisture as it leaves the meat like a gas grill or a high temperature charcoal grill. It is more of a roast than a sear, and as such it is exceptionally useful to be able to monitor the temperature a time or two as it cooks. You time estimates that Traeger provides are reliable, but cooking the meat to just the temperature and then letting it rest will produce amazing results. If I could find someone willing to cart off our Dacor gas grill, I would be very happy to switch over 100% to the Traeger. I should have known I bought the wrong grill when I realized I had to keep a fire extinguisher handy whenever I was cooking. Why do I want to produce 20,000 BTUs? I have nicknamed that gas grill “the incinerator”, and if it wasn’t made of stainless steel it would be rusting into oblivion. What I want from a grill is awesome tasting meat and the challenge of trying to make it a little better every time. And you put those together (plus some Hay Mama grass-fed beef) with an incredibly easy to use machine and you have the makings of some great meals. I am happy to share my first blog entry for Hay Mama! In this first post I want to talk a bit more about P Bar Ranch and how we think about our relationship with the land. As many of you know, I grew up in Grand Junction, a wonderful small town in Western Colorado. My upbringing was heavily influenced by my dad’s decision to buy a small farm outside of town. At a young age, I got exposed to the many activities and skills required to run a farm, including irrigating, building fence, operating and repairing machinery, and caring for livestock. My dad (a practicing orthopedic surgeon) believed in keeping busy, and one of the great things about a farm is there is always plenty to do! I loved everything about the place and realize now what a special experience it provided me as I grew up. One unique aspect of my farm experience was my dad’s incredible appetite for reading. Our dining room table was covered with stacks of magazines and medical journals, and we also had books by the great conservation thinkers like John Muir and Aldo Leopold. It sounds more ideal than I am sure it was in reality, but I remember spending my weekends working with dad on various projects on the farm during the day and in the evening (most likely before I had my driver’s license) I read these books and absorbed a perspective on the natural world that enriched my appreciation for what we were doing on the farm. I was particularly lucky that my dad was pretty much willing to take on any project, so we ended up starting a small herd of cattle that increased to 30 cows by the time I finished high school. We sold off the herd when I went back east for college, and I like to think that a good portion of my first year’s tuition was covered by the proceeds (it would take some pretty creative accounting for that to be true!). When our family purchased the first part of P Bar Ranch in 1998, a primary driver of the decision was my dad’s desire to have a place rich in wildlife and natural beauty that we could care for and enjoy as a family. In the years since, we have expanded the size of the ranch and we have implemented land stewardship practices that have made a very positive difference to the health of the land. A major focus has been enhancing the health of the riparian area. The cottonwood bottoms along the river had a Park-like quality when we bought the ranch, with huge old trees dispersed in a manner like you would see in Central Park. But there were no young trees! To encourage regrowth of cottonwoods and willows, we reduced or eliminated grazing in the riparian area. Ranchers traditionally utilized the riparian area for its abundant forage but also for natural shelter for cattle and horses in the winter months. The grazing and browsing resulted in the young trees never growing beyond an immature state. We invested in stock water tanks and wells that allowed us to water the cattle without requiring access to the river. We also fenced out the riparian areas from the open pastures. It has been almost 20 years since we implemented those changes, and today we have a riparian forest that has a generation of young trees that are 50 feet tall and we see an amazing difference in the richness of the habitat. We mow several miles of trails thru the riparian area to make it easy for us and our guests to enjoy this remarkable environment. In future posts I will talk about some of the other management practices we have implemented to make the ranch as healthy as it can be. This work is rooted in what I was exposed to as a young person, and I will be forever grateful to my father and the many others who have provided the inspiration that has shaped our approach to stewardship of a wonderful part of the Rocky Mountain west that we call P Bar Ranch. This entry was contributed by Helen Shepherd, Kristi's mom. She is an incredible chef, a thoughtful foodie, and an uber-Grandma. Were I to write a cookbook, I would title it “My Passion 4 Food”. My food journey began, as with most of us, with meals prepared by grandparents and parents. My mother enjoyed cooking as did her mother. My mother was happiest in the kitchen. It was never a chore. Laundry, cleaning the other tasks could wait. The kitchen was the soul of our home. The kitchen was where you would find me, after school, sitting on our kitchen barstool, sharing my day, as she prepared the family meal. My presence in her domain was to keep her company. I was a keen observer, as I watched her chop, slice, dice vegetables and fruits. She would saute, roast, fry and bake poultry, meats, and fish. Whiffs of homemade breads, cakes and pies filled the air on so many afternoons. Breakfast, lunch, and dinner were made with loving care. Preparing high quality food, with the freshest of ingredients, were important to her. I recall when TV dinners came on the scene in the 60’s, and she would have none of that. I am convinced this special time with her launched my interest in food, without me even realizing it. When I married, and was testing out my food world, I distinctly recall preparing my first simple home cooked dinner. It was tasty! From planning to shopping and preparing, I was captivated by my new creative endeavor. I began with simple meals, but over the course of years, my taste buds, interest, and knowledge in the food world expanded ten fold. With the opportunity to travel, meet and make new friends from other cultures, my interest in food choices became boundless. My cookbook collection expanded, recipe files overflowed. I also became interested in improving the nutrition component of meals to make sure we enjoyed the healthiest options. I feel very fortunate that both our daughters enjoy being part of my food world and now are on their own journey. They too, were excellent observers. I think it is part of their DNA! For my first Hot Off the Grill recipe, I have included a terrific and easy Beef Stroganoff recipe. The very best sirloin steak. Thanks Alton Brown. Welcome to the Hay Mama blog. We are just getting started so check back soon for additional content. We'll be providing articles, recipes, and other resources as well as answering questions you might have.